Organizing the perfect bachelorette party can be a lot of fun, but it will require some good planning. To help decide on what direction to go, think about the bride-to-be's personality and style. Is she normally wild and crazy? Or is she more of a conservative type? 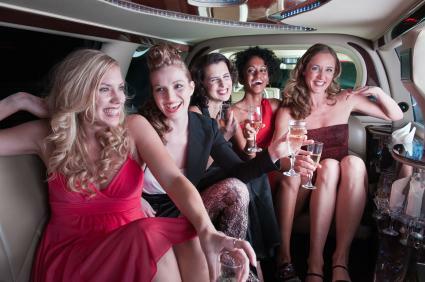 Either way, here are some great ideas to make her bachelorette party a memorable occasion. You can put together a wild bachelorette bash, or you can throw away any preconceived notions about what the party should be and go with a bold, new idea. Here are 15 ideas to get you started. This is the standard bachelorette bash filled with drunken revelry. Hire a limo for the evening so absolutely no guest will be driving. Visit two or three of the bride-to-be's favorite clubs. Present the guest of honor with naughty gag gifts. If you live anywhere near a vineyard, consider scheduling a wine tasting adventure for you and your best girlfriends. Rent a large van or, better yet, hire a limo to drive everyone to the vineyard. Take a tour of the vineyard and see how the wine is made. Indulge in some wine tasting. Culminate the evening with dinner at a fancy Italian restaurant, spending time talking and laughing about old times and new times to come. If the bride-to-be likes to volunteer to help good causes, consider inviting all of her friends for a joint volunteer effort to maximize her good efforts. This can actually be a fun and truly unique bonding experience, and you can always go out to dinner or a club later that evening. Give details in the invitation. Not everyone may think that stacking canned goods, working in a soup kitchen or sorting through used clothes sounds like a good time. Be sure to give them plenty of fair warning in the invitation. Plan a corresponding lunch or dinner for before or after the volunteer event. For those that prefer not to donate their time, the lunch or dinner provides an option to stay involved with the bride-to-be without necessarily having to step outside their comfort zone. If possible, wear unique party shirts with the bride-to-be's name on them. This will call attention to your group and allow passersby to congratulate the upcoming bride, which makes the event all the more fun. Ask party guests to donate money to the cause rather than give gifts. The bride-to-be and her bridesmaids will certainly enjoy spending a day or a weekend focusing on more healthy activities at a spa. Spend time in a sauna. If this option is a bit too pricey for you and your wedding party to handle, why not create your own spa experience at someone's home? Light candles, purchase a few yoga tapes, and provide a variety of health foods and drinks for everyone to enjoy. Good food and good friends can be just the right combination for a unique kind of bachelorette party. Sign up your group for a local cooking class. Alternatively, spend an evening concocting your favorite recipes in the home of one of the attendants. Be sure you all know in advance what you plan on cooking, and have everyone bring assigned ingredients. Spend the rest of the evening enjoying the delicious food along with a glass of wine or a cup of coffee as you reminisce about the bride's wilder days. If your wedding party consists of serious runners, you may want to choose a longer race, but a 5K can work for newbies as well as seasoned runners. Spend the weeks before the race training together. For those who live in other areas of the country, create a blog or Facebook site dedicated to preparing for the 5K run. Attach a cheap veil to a runner's headband for the bride-to-be to wear at the event. Have T-shirts made for everyone in the group to identify them as part of the bride's bachelorette party. Plan a group trip to a nearby running store so everyone can pick up any gear they'll need for the run. Getting away to the mountains can really give the bride-to-be and her circle of friends time to connect, relax and re-energize before the wedding. Reserve a night or two at a mountain resort. Spend the evening enjoying a delicious meal. Get up early the next morning for a hike along some nearby trails. Finish off the day with a long soak in the hot tub. Plan a road trip for the day or the weekend. Choose a destination the bride would really like to visit. Perhaps something like a theater in Branson, Missouri, a Yankee Candle Flagship Store, or some historic site. Checking out quaint shops along the way. Eat at small diners instead of chain restaurants so you get more of the "local flavor." For thrill-seeking enthusiasts, almost nothing is more fun than jumping on a roller coaster and going for a spin. Invite your guests to join the bride-to-be at the park or ride together. Here are a few ideas to make the day even more special. Be sure to don bachelorette or wedding party T-shirts or tank tops. Call ahead to see if the park offers any "bride-to-be" buttons or free memorabilia for the bride. Make sure the bride's shirt is white. If having lunch or dinner, ask someone to bring a cake ahead of time. Arrange with the restaurant and wait staff to present the cake as a special surprise for the bride-to-be at the end of the meal. If possible, decorate the party area with white balloons, confetti, and streamers. Take a lot of pictures for the bride to use later in her scrapbook, wedding album or to create a unique wedding slideshow. An old-fashioned movie night with the girls will bring back memories of the bride's single days. Rent some of the newest releases that no one has seen yet, along with one or two of the bride-to-be's favorites. Put on your pajamas, pile up the pillows, and spend an evening watching everyone's favorite movies. Add some popcorn, a lot of chocolate, and some wine for even more fun! If you're sure the bride-to-be and her friends are the adventurous type, plan an extreme activity. Take a scuba diving class. Even if every guest doesn't want to actually participate in the activity, they can have fun watching those who do, and then you can all go to a restaurant or club afterward for a more traditional party. If you live near a cruise port, consider taking a cruise. Get a head count for the party and make reservations well ahead of time. Consider a two-day weekend cruise if that's in everyone's budget. As a less expensive alternative, get together for a one-day river cruise. You could also charter a boat and take a private cruise. If the wedding is near Halloween, plan a bachelorette party around that holiday theme. Invite guests to dress up in their favorite Halloween costumes. Hold the party at home and serve finger foods and other festive foods like candy corn, pumpkin bread and witch's brew fruit punch, spiked if you like. Alternatively, take the party to bar where they're celebrating Halloween. Christmas-themed bachelorette parties are even easier to pull together. Ask guests to dress in holiday attire. Ask them to bring gifts for the bride wrapped in holiday paper. Find someone to tend bar, look up recipes and supply all the ingredients for three to five Christmas cocktails. Schedule the party close to Valentine's Day, but not on it so the bride-to-be can spend that special day with her fiance. Invite guests to dress in their favorite lingerie. Hire a male model to serve drinks dressed as Cupid, of course. Play risque bachelorette party games. No matter which kind of party you eventually decide on, set the date of the bachelorette party at least a week before the wedding. You want the future bride to look her best on the big day and not hung over and sleepy. She will appreciate it. By taking care of these little courtesies and considering her likes and dislikes, you are sure to give the bride a party she will always remember.